Collector Howie G. sent me the following information about how he tracked down an unusual replica of the Georgia Railroad Bank. “During a recent business trip to Orlando I called upon fellow building collector Marty G. I had never seen his collection, and Marty and Jakob graciously invited me to their beautiful home to see their most impressive assemblage of souvenir buildings. When I arrived, Marty had thoughtfully placed some of his most prized possessions on a separate table for my viewing pleasure. My eye immediately focused on the large Georgia Railroad Bank building, which I had never seen before. 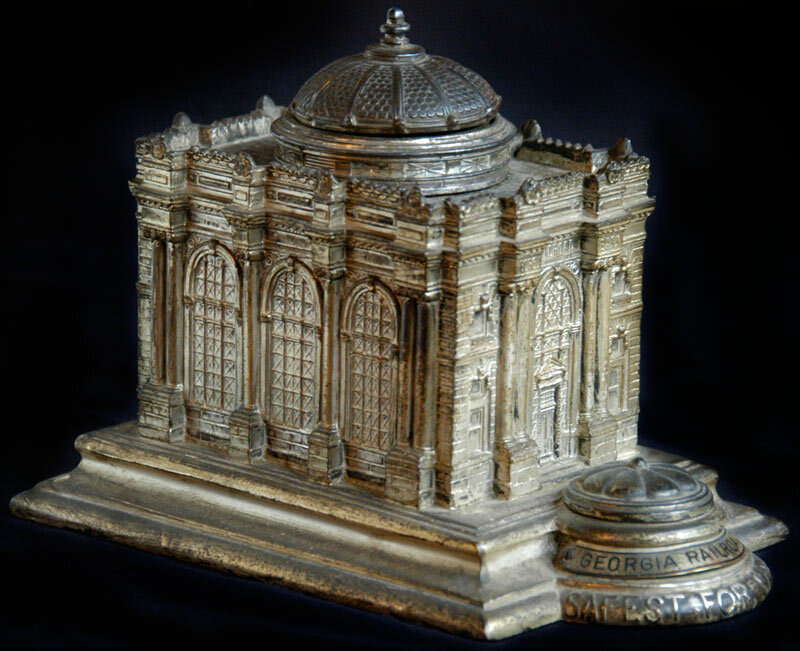 An impressive 7 or so inches tall on a 5 by 7 inch base, this lead replica includes a clock and an inkwell. It’s very similar to some Art Metal Works pieces such as the Maryland Casualty Company, Vanadium, and US Fidelity & Guaranty buildings. Try as I might, I could not cajole Marty into even considering an offer to let it go. Indeed, he told me it was one of his favorite souvenir buildings, and I could certainly understand why. An optimist by nature, I left his home with dreams of one day finding a Georgia Railroad Bank building. Once back in New York, I commenced a full court press, first researching the building to determine its location (Augusta), then followed up with every local antique dealer, collector, newspaper, museum, and historical society I could find. Unsuccessful but undaunted, I began researching the names of people that had worked at the bank. One replied to me that most of the souvenirs were destined to remain in Augusta where they belonged, and not sold to a Yankee building collector up north. I eventually heard back from a gentleman whose father had been a director of the bank, had recently passed away, and sure enough, had the object of my desires, for which he would consider a fair offer. Long story short, it’s now safely ensconced in my collection, but will be heading west soon for a professional paint stripping and restoration. “ – Howie. 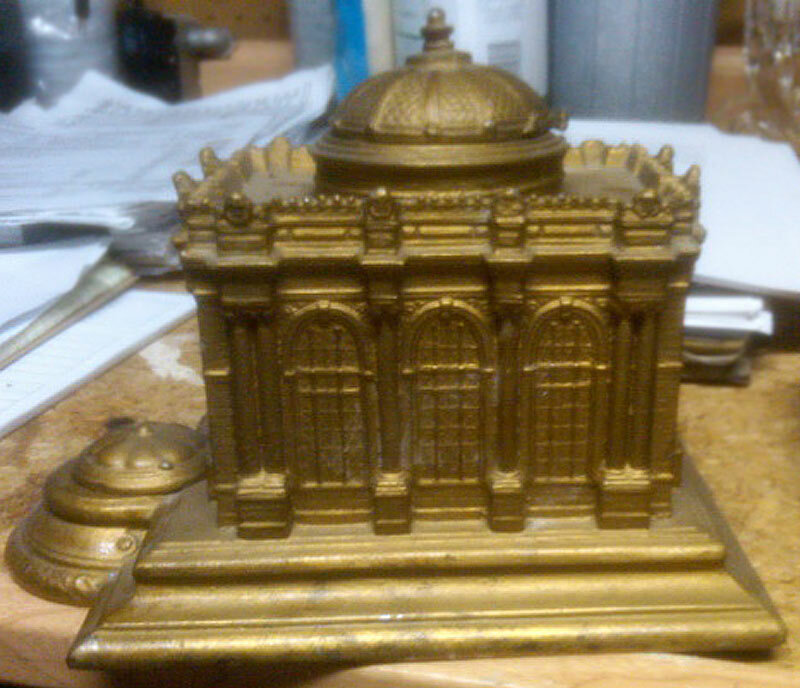 The souvenir building replica may be from the early 1900’s and made from lead by the Art Metal Works company. The real Georgia Railroad Bank and Trust Co.’s Main Office building was located on Broad and 7th Streets in Augusta, Georgia. Constructed in 1902, the building was renovated and became part of the C&S Bank around 1968-1969. I could not find much information about the building’s current status, but checked on Google maps and it does not appear that the structure still exists.